Chris Cook is a true Original, in that he is a Classic. Chris Cook’s To Lose & To Pretend is evidence of a fine mind at work, a collection of poems that never settles for the obvious. His work probes the apathy and alienation of his generation, wielding poetics like a cudgel to extract the essential from the incoherence of pop culture vapidity that we have accepted as our metaphor. Startlingly honest, unafraid of humor, these poems force you to sit down and take notice. The kaleidoscope of could have-would have-should have in Chris Cook’s poetry both dazzles and amazes, taking the reader on a journey into the buzz of pop culture and the silence left in its wake. Anything is possible in these poems, and yet there is an awareness of the limitations of the world, particularly the world that is artificially constructed. 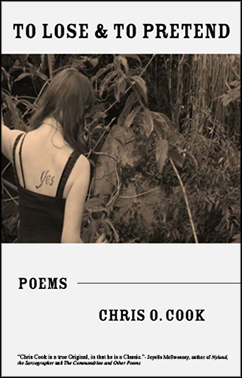 With the scope of Ginsberg and the sensibility of the Romantics, Cook’s poems are a place where listening to the rain counts as conversation, and the language eclipses the grating like rising dough. 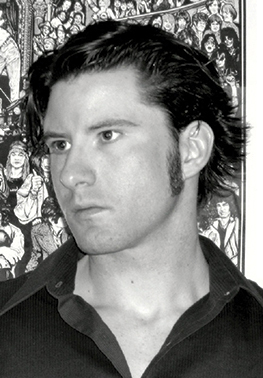 Chris O. Cook received a BA in English from Kenyon College and an MFA in Poetry from the Iowa Writers’ Workshop. He’s worked as a costume-store stock boy, video-store know-it-all, mall-kiosk polltaker, locker-combination changer, standardized-test grader, and monorail conductor. He’s taught at the University of Iowa, Kirkwood College, Kendall College, North Park University, DePaul University, and Harper College. He currently lives in New York. Chris O. Cook was honored to be the first poet interviewed by students for the San Francisco Humanities Review‘s “Writers at Work” series, offering a candid dialogue between students and writers. Follow him on his blog.